More than 130 migrant agriculture workers from Mexico and the Caribbean have gone home cheated of thousands of dollars, after the Ontario farm they worked at filed an intent to get creditor protection. Workers had not been paid since early November, after the owner departed for California. He has yet to return. Ottawa — On December 17, James Clancy, National President of the National Union of Public and General Employees (NUPGE), attended the Supreme Court of Canada review of the Ontario Court of Appeal ruling that in November 2008 ordered the McGuinty Liberals to drop its ban on farm unions. 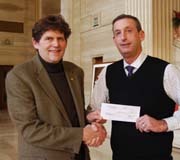 Clancy pledged his union’s support to the UFCW Canada cause, and used the occasion to present a $15,000 donation from NUPGE’s Social Justice Solidarity Fund to the Agricultural Workers Alliance (AWA). UFCW Canada, the Agriculture Workers Alliance (AWA), Migrante Ontario, a community group part of Migrante International, and CHRY, a progressive community radio station based out of York University in Toronto, recently sponsored an International Migrants Day Celebration by joining community allies at a forum that focused on cooperation and the different ways social justice groups can work together to make Canada a more just place for its most vulnerable workers - migrants and immigrant. While deaths and injuries continue on Alberta farms, the Stelmach government continues to resist adopting the inquiry recommendations of Alberta Justice Peter Barley. Migrant agricultural workers from Honduras began toiling in Quebec fields this week, after a Quebec farm lobby group and Honduran officials cut a deal to bring the workers to Canada under the federal government’s controversial Temporary Foreign Workers (TFW) program.